In late 2013, The Disney Store released a wonderful collection of six "3D character" mugs. 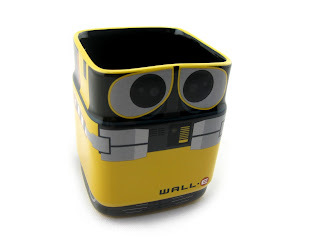 Included in this release were Nemo and Bruce, Wall·E and Eve, Hamm and Mr. Incredible. These mugs were pretty much everywhere for a while but then they started to sell out...fast. I was able to get most of them at the time, however, the Wall·E one was long gone by the time I was looking for it for my collection (and very pricey on eBay). It was by far the most popular of the six. For over a year, my Eve mug has sat lonely on the shelf wondering when her robot love would join her...that is until now! 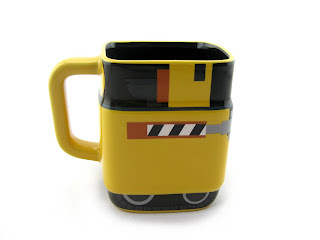 I was incredibly surprised to have received the Wall·E mug from my parents last month for my birthday. Just days before my birthday, it had casually come up in a conversation with my mom (I hadn't asked for it), so you can imagine how shocked I was when I opened it. How she found one and got it there that fast is beyond me! At any rate, I'm thrilled to finally have it as part of my collection. A big thanks to them! This rounded square ceramic mug holds 16 fl. oz., is microwave and dishwasher safe and originally retailed for $12.95. It has some great details and looks great standing right next to Eve! This is definitely a highlight of my Wall·E collection. If you're looking to add this to your collection as well, be sure to check out eBay using this direct link. Good luck on the hunt and please let me know if you have any questions or comments!